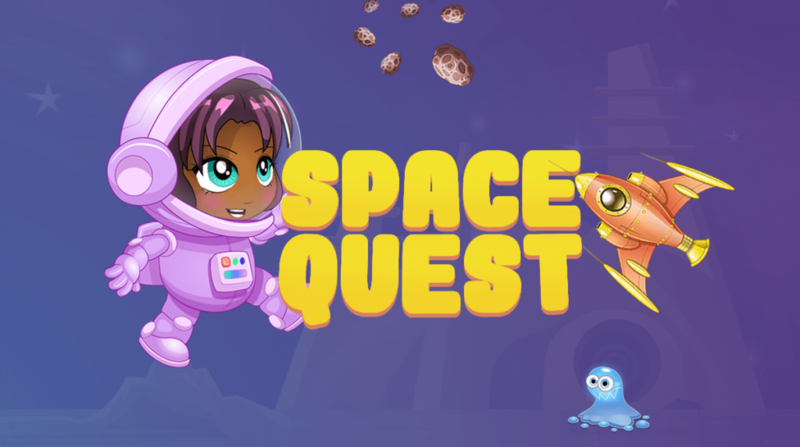 Kids learn to code by helping Mae find a new spaceship in Space Quest! Mae always knew that she wanted to pursue a career in STEM. With the help of her parents, who fostered her curiosity by transforming ordinary days into learning experiences, Mae was drawn to science through the study of nature. Although her parents were very supportive, she wasn’t always faced with encouragement outside her home. “In kindergarten, my teacher asked me what I wanted to be when I grew up, and I told her a scientist,” Jemison told Ebony. “She said, ‘Don’t you mean a nurse?’ Now, there’s nothing wrong with being a nurse, but that’s not what I wanted to be.” Today, Mae is not only a scientist but also an astronaut, engineer, doctor, entrepreneur, teacher, author, dancer, actress, and an advocate for science literacy in children. When she was just sixteen, Mae moved to California from her hometown of Chicago in order to study chemical engineering at Stanford. In further pursuit of her career in science, Mae went on to attend medical school at Cornell University. After spending several years serving in the Peace Corps and practicing as a medical doctor, Mae, prompted by Sally Ride’s 1983 journey as the first American woman in space, applied to NASA’s astronaut program. In 1992, she stepped aboard the space shuttle Endeavour as the first African-American woman to go into orbit. Mae spent nearly eight days in space, during which she led an experiment to see how tadpoles develop in zero-gravity conditions. Although she eventually resigned from NASA in order to explore the intersection between social sciences and technology, Mae’s time as an astronaut was incredibly impactful. Mae’s drive to expose people to science continued after her resignation from NASA. In 1994, Mae founded The Earth We Share, an international science camp dedicated to promoting science literacy for kids. At TEWS, students work together to solve a problem, such as creating a global budget for science and technology research, empowering kids to creatively use technology to help others. Mae also serves as the principal of the 100 Year Starship Foundation, an organization dedicated to sending humans outside our solar system within the next 100 years. Imagine everything we’d learn by going beyond our solar system! Mae’s entire career is rooted in encouraging a love of science, especially in kids. She believes the key to having students succeed and continue careers in science is exposure. “I think that there are really important things that we have to do with students to get them to succeed in science, to go on and stay with careers,” she told NPR. “And that includes the idea of being exposed to something…if you know that those things [science and math] exist, it makes it easier for you to get involved. Here at Tynker, we provide the opportunities for kids to be exposed to and encouraged when coding. Check out our courses and empower children to explore and make with science. Encouraging them may just create future kindergarten scientists like Mae! This article is part of a series on women in STEM – check our blog soon for the next one! Inspiration Strikes Natasha – Then She Codes! Jake is a Self-Taught Coder!